Wolverhampton is once again supporting the United Nations’ annual 16-day Orange the World campaign, which begins on Sunday (25 November), with a wide range of activities taking place organised by businesses, community groups and individuals to “Orange Wolverhampton”. In doing so, they are helping to raise awareness of Wolverhampton’s drive to end gender-based violence, primarily committed against women and girls, including domestic abuse, female genital mutilation, forced marriage, so-called ‘honour-based’ violence and sexual violence. At the same time, they will be highlighting the help and support that is available to victims in Wolverhampton from local and national organisations such as The Haven, Wolverhampton Domestic Violence Forum, St George’s Hub, Karma Nirvana and the City of Wolverhampton Council. And politicians are also throwing their weight behind the campaign. Councillor Roger Lawrence, Leader of the City of Wolverhampton Council and leader of the council’s Labour Group, said: “The Orange Wolverhampton campaign is a vitally important way in which we can all highlight the issue of gender-based violence, and the help and support that is available to victims of this abhorrent crime. “Gender-based violence is primarily committed against women and girls and can range from domestic and sexual abuse to female genital mutilation, forced marriage and so-called ‘honour-based’ violence. 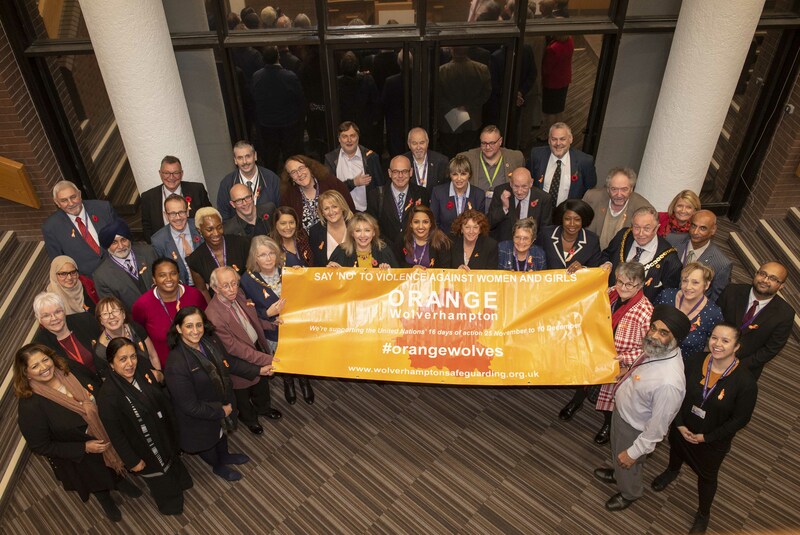 Councillor Wendy Thompson, leader of the Conservative Group on the City of Wolverhampton Council, said: “We are very happy to support the Orange Wolverhampton campaign and we hope that everybody will take this opportunity to get involved and help stop violence against women and girls. The city’s three MPs are also backing the campaign. Wolverhampton South East MP Pat McFadden said: “This year, I will once again be supporting the Orange Wolverhampton campaign. Wolverhampton North East MP Emma Reynolds said: “Orange Wolverhampton is an important campaign highlighting the United Nations’ international 16 days of action to end violence against women and girls. “Domestic violence is a hidden crime and it is estimated that more than a quarter of women experience it in their lifetime. Around four in every five victims do not feel confident to report it to the police. This is a huge issue and the police must give victims the confidence to come forward so they can get the right support, and the Government must put in place stronger guidelines which protect women. And Wolverhampton South West MP Eleanor Smith said: “Orange Wolverhampton’s work locally in supporting the UN’s campaign to end violence against women and girls is brilliant. To find out more about the Orange Wolverhampton campaign, which is championed and run by Wolverhampton Safeguarding Boards, the Safer Wolverhampton Partnership and Wolverhampton Domestic Violence Forum, please visit www.orangewolves.net. Follow the Orange Wolverhampton campaign on Twitter and share your support and photos using the hashtag #OrangeWolves and by following www.twitter.com/wvsafeguarding, or follow and share via Wolverhampton Safeguarding Boards’ Facebook page at www.facebook.com/wolverhampton-safeguarding. More than 50 organisations took part in last year’s campaign, wearing orange, turning their websites and social media channels orange, sharing key messages about the campaign with staff, customers and service users, holding orange cake sales or coffee mornings, lighting their buildings orange, flying orange flags and much more. Some 16,000 people also showed their support by wearing orange ribbons throughout the 16-day campaign.